I switched from photographers block to writers block! So I wanted to talk about some photos I have taken recently. Talk about my thoughts at the time. This reminded me of a song ‘Bent – Private Road’. 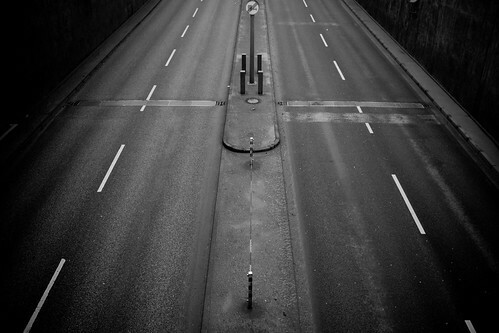 The dark and dullness of the road and the fact that even in rush hour, Berlin I managed to get the road clear. Some people that know the area are wondered if I used some magic shutter speed trick to delete the cars. No I was lucky! It’s a fine example of how a photo walk should work. You don’t look up but also down and around you making sure you take everything in. When I crossed this street I noticed that below there was an autobahn entrance so I took the shot. Later I added the vignette and changed the image to grayscale. If you friend of mine since the very beginning when I would try very new things out with my Fuji S5700 this whole image will look familiar. I revisited a street corner where I first tried panning. This time I took the shot with my Canon 450D. There is nothing spectacular about it other than revisiting some techniques I had forgotten. Something maybe is worth doing. This image was left unedited! Bad shot turned good. Ok it’s not the most pleasing photo I have ever taken. But there is something about this. The clouds, the blur and the incorrectly configured white balance – everything was wrong but then it worked. It retained this retro old school Polaroid look for sure. This building is not far away from Alexanderplatz. I was inspired by the Italian Photographer Gabriele Basilico. Here is Gabriele Basilico image. Although I love his style, this particular photograph bothered me. I felt it was incomplete. I mean I know the building and have pasted it a number of times and I felt he missed what the building was. Its height, its randomness and eastern Berlin scars. So I took this shot in an attempt to bring the building into a new light. I have not failed in that regard but I don’t think I managed it! The image was originally taken in color and I moved it into grayscale. Photoshop: Finding the rule of thirds every time. This is a short action tutorial for drawing guides in Photoshop that display a rule of thirds grid no matter what the resolution of the picture. It can be really useful when cropping in Photoshop saving you the hassle of opening the image in something like Lightroom just to crop. - Press ‘Ctrl+R’ to display your rulers. - Go to your actions tab and create a new action – Call it ‘Rule of Thirds’ and assign a hot key. - Stop the action from recording. I have not made a post in a while because I have been suffering photographers block but thankfully I am seeing light at the end of the tunnel. I got some new content lined up. Some photoshop tips and a bucket load of Links for friday! February Theme “Perspective” Competition – Votes start on the 25th so get snapping! Random Word Theme Thread – Hopefully never ending! That’s it for now. Thanks for reading Hatphoto! 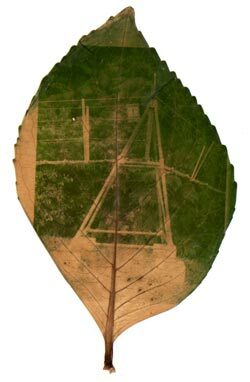 She manages to expose a photo directly onto a leaf. I have to admit this idea is uber geek and AWESOME! LIME004 – Quick Ambient Light Portraits from Lime Photography on Vimeo. How I Compile A Time Lapse! I got several questions after my recent post about making a time lapse video, about which software I use compile the images into a finished video. Download your images from the camera to a local drive. I found that since these images are typically nothing to do with my normal work flow and I tend to manually move them instead of using lightroom or canons own management tool. With your finished AVI you can bring it into any video editing software to add music and to add additional movies etc. A while ago I attempted to make a time lapse video using the S5700 (sorry there is no post for that) but I hit quite a few road blocks in terms of the cameras speed and performance. In the end I had to abandon the experiment as it seemed impossible to get the effect I wanted. But things have changed and I have a Canon 450D now which is a very powerful DSLR. The basic idea of time lapse is this, you take a series of images of a scene thats moving and put them together to make an animation or video. You can do this by using the continuous shooting mode which when you hold your shutter release button it will not stop taking photos until you let go. You will find it better to use a remote of some kind if you are using a Canon or Nikon. You can also get them with timers on them so you can take an image every 20 seconds or every 2 hours. In the Fuji S5700’s case there is no remote at all available for it so a trick I have learned is to get a rubber band and some paper and used the band over the shutter release button so it pushed the paper into the button. Unfortunately to get a really good time lapse you need a fast camera that can take 3 or more frames in a second. If you imagine taking a time lapse of a street crossing. When a person starts to cross the road you would start shooting. But with a camera thats slow, by the time you have taken the second image the person will be either out of the frame or at least a great distance to where they started. This is not smooth and can cause an effect called “blip”. Where people or objects are only seen for a frame or two when in motion. This was the core issue with the Fuji S5700 as it takes 1.4 frames per second and if something was fast moving it would blip. In the other hand the Canon 450D can take 3.5 frames per second which is perfect. The next thing to remember is too “drag your shutter”. This was at first a difficult concept for me to understand so I hope I can explain it. To obtain a perfect exposure you must configure three settings in the camera: ISO, Shutter Speed and Aperture. Your photo is a product of a balance of the 3 values. To drag your shutter you need to slow the shutter speed down and use the aperture and ISO to compensate for the large amount of light that would come through (assuming your taking a time lapse during the day). So if you where to take an image with a F3.5, Shutter of 1/250 and ISO 200 you would need to lower the shutter speed, close the aperture and lower the ISO. I would then use F22.8, 1/3 shutter and ISO 100. The effect is that anything that moves into or across the frame will have a motion blur effect and when you make your final time lapse the motion will look smooth and effective. One final thing before I show you the demo I made. Using the Canon 450D as an example – If you set the camera to the highest quality you will get about 10 shots before you have filled the buffer and then the camera will slow down the picture taking process. Lower the quality and you wont have that issue and the camera will continue to take images uninterpreted. Canon 450D Time Lapse Test from The Laddie on Vimeo. In my next post I will look into how I make this into a video. Following Rob’s lead I thought I would give stock photography a go and sign up to Istock. I thought that since Rob was getting some Fuji S5700 gems into their site that my Canon 450D might just make things that little bit easier. At this time we regret to inform you that we did not feel the overall composition of your photography or subject matter is at the minimum level of standard for iStockphoto. Please take some time to review training materials, resources and articles provided through iStockphoto. The photographs provided in your application should be your best work. Try and impress us, we want to see how you stand out from the crowd. Not really what I wanted to hear. I thought at the least they would tell me whats up with the individual photos? I mean thats what Rob gets? This experience has left me a little lost to what I done wrong if anything at all? So I am going back to basics and relearn everything I have learned. Hopefully then I can get back to the flash stuff I was learning too. I will admit though that if you consider moving from even a bridge camera to a DSLR you might want to look again over your learning materials. For the Fuji s5700 for example some of the effects and rules are different because its a fixed lens camera. DSLR might not be setting wise all that different but its better to be up to speed. As the forum is still warming up I would like to make a little vote for the next competition starting in February. The vote will find the theme. I am really excited about this as its not just the Fuji vs. Fuji but rather Bridge vs. DSLR!!! So the vote will end on the 30th of January.